An early morning fire outbreak has burnt down seven classrooms at Badawa Secondary School in Nassarawa Local Government Area of Kano State. The spokesman of Kano police command, Abdullahi Haruna Kiyawa, who confirmed the incident in a text message Monday morning, said no life was lost in the inferno. He attributed the incident to electricity spark from one of the laboratories in the school. He said the fire broke out at around 1:30am. 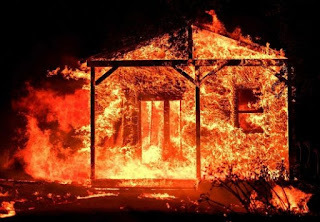 “25/03/19, fire incident at about 0130hrs there was a fire incident that occurred at Badawa secondary school that burnt down 7 classrooms. “Cause of the inferno was suspected to be as a result of an electric spark from one of laboratory class. “No loss of life or injury recorded” he added.